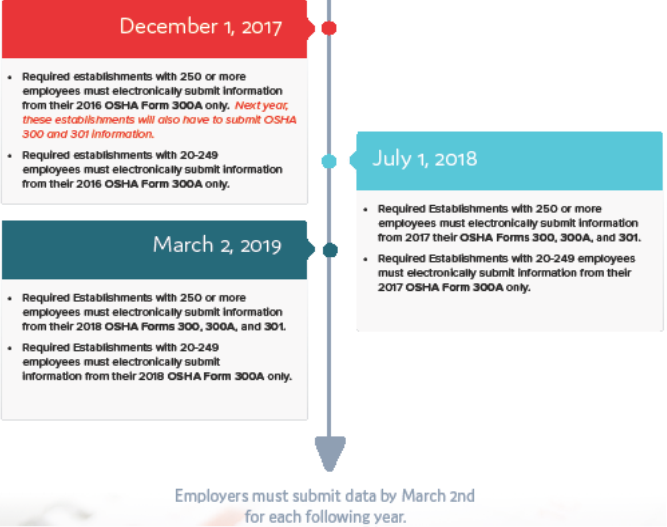 OSHA requires employers with 250 or more employees to submit form 300A electronically by December 1, 2017. Employers with 20-249 employees that are classified in certain industries must submit form 300A also by December 1, 2017. This includes, but is not limited to: construction, manufacturing, retailers/wholesalers, nursing and elderly care facilities, hospitals, community relief services, vocational rehabilitation, traveler accommodation, performing arts, agriculture, waste management, and the list goes on. Find that list here. Electronic reporting requirements are based on the size of the establishment. An employer may be comprised of one or more establishments. Determine the establishment’s peak employment during the last calendar year. Each individual employed in the establishment at any time during the calendar year counts as one employee, including full-time, part-time, seasonal, and temporary workers. WHAT data must I submit by December 1, 2017? The following information must be submitted for each required establishment. 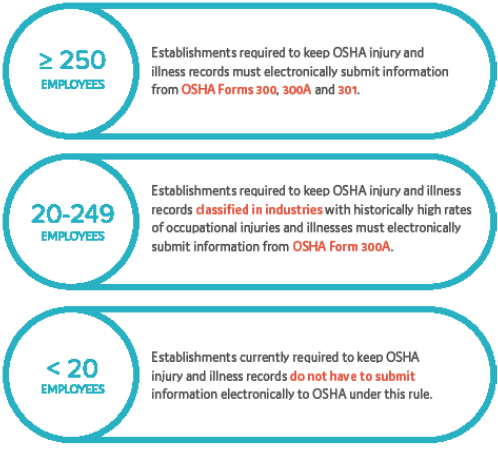 Data for each establishment should come from that establishment’s completed OSHA 300A Form. WHY have they made this rule? OSHA expects this new rule will help improve workplace safety through expanded access to timely, establishment specific injury and illness information. The rule will provide OSHA with data to assist the agency in improving allocation of compliance assistance and enforcement resources. Behavioral science suggests that public disclosure of the data will “nudge” (their words, not ours☺️) employers to reduce work-related injuries and illnesses. Access to establishment-specific data will enable employers to benchmark their safety and health performance against industry leaders. On August 1, 2017, OSHA launched its Injury Tracking Application (ITA), a secure website for the electronic submission of OSHA recordkeeping information. For quicker and simpler submission process, the ITA offers the option to upload a CSV file contacting OSHA Form 300A data for all of your establishments at one time. For those organizations without OSHA recordkeeping software, you will be required to complete a manual submission to OSHA. You will first need to add your establishments to the application by creating profiles for them. Once you have set up your establishments, you can then enter and submit OSHA 300A data for each one via a web form. 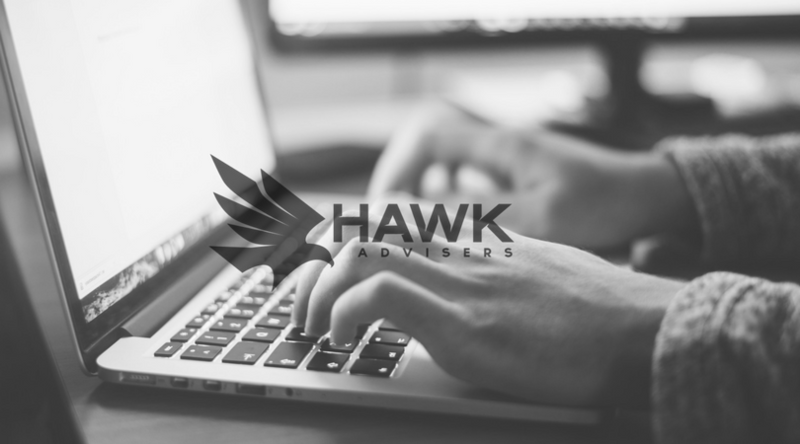 HAWK Advisers has partnered with a web-based injury intelligence platform to simplify the OSHA electronic reporting requirement! Users can also create accident reports, track injuries, print required OSHA documents, and view injury metrics in real-time. Additional information will be sent out in a separate e-mail. Please let us know if you are interested in learning more. Click Here to send us an e–mail request.